SCOTT PING’S DECEASED MOTHER came to him in a vision last March. Her words may have saved his life. Ping was face down in the snow at his ranch in Whitefish with a broken neck between C1 and C2 vertebrae — the same break that left Christopher Reeves a quadriplegic. Ping had hit a soft spot while training on his skijoring track — at full speed, alone, and at dusk — and his horse had gone head over heels. “I couldn’t move,” recalls Ping, sounding like he is recounting a favorite movie rather than his own near-death experience. Why a 60-year-old man would risk life and limb for a fringe sport called skijoring comes down to one word: adrenaline. Ping thrives on the rush provided by a horse and rider pulling a skier around a horseshoe-shaped, 800-foot-long course at high speeds over jumps and around slalom gates. The sport of skijoring began several hundred years ago in Scandinavia as a way to travel during the long winters, with skiers pulled by dogs. Skijoring found its way to North America, where ranchers attached a long rope to the saddle horn of a horse that was ridden at high speeds down a long straightaway. Today, equestrian skijoring has become a highly-specialized competitive sport, and Whitefish has seen the fastest growth since its revival in 2002. Skijoring started here back in 1959 as part of the Whitefish Winter Carnival, an idea launched by Norm Kurtz to spur business in the post-holiday winter doldrums. The races originally ran on Central Avenue — complete with flaming rings that riders jumped through — but insurance problems cancelled the competition in 1982. Ping and his buddy, Dale Duff, 63, revived the idea in 2003 and moved the event out to the fields of the small municipal airport. 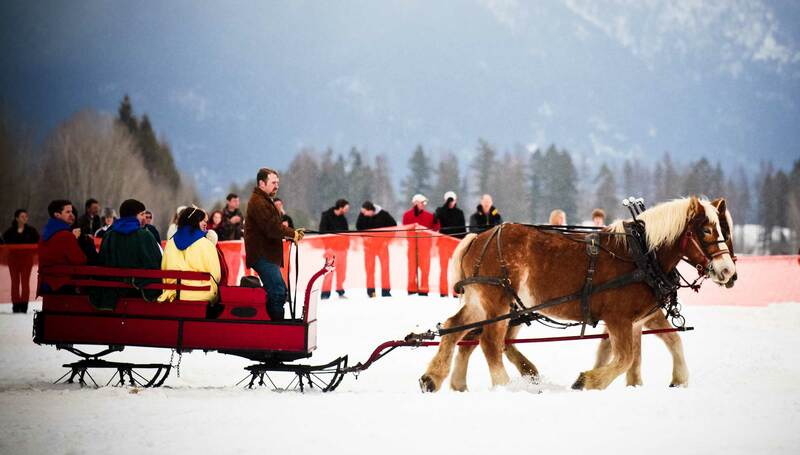 The first winter drew 25 entries and 1,000 spectators. With growing momentum over the past nine years (the ’05 event was cancelled due to an unsafe icy track), organizers realized that the Whitefish competition was the largest of its kind for both competitors and spectators, meriting the title of World Championships in 2011. More than 5,000 spectators showed up last winter to witness the fastest times ever recorded in Whitefish history and a record field of 91 teams vying for a purse of over $25,000. Organizers are even pushing for skijoring to have a second shot as an Olympic exhibition event — it made its only debut in the 1928 St. Moritz Winter Olympic Games. The World Championships run again this winter, January 28-29, for the ninth annual event. While crowds watch the horse-mounted cowboys tow both professional and novice skiers around the timed-course, a carnival atmosphere ensues, propelled by blaring music and the voice of one of the best rodeo announcers in the industry, Joe Warner. Some of the skiers use the g-force of the rope to propel themselves to speeds approaching 50 miles-per-hour, and the crashes — while disappointing to the teams — can be spectacular. Notably though, in the eight years since the event’s revival, competition injuries have been limited to a blown-out knee. Strict safety guidelines are adhered to in order to protect both the horse and rider, with veterinarians ensuring each horse is fit to run. Last winter the team comprised of Helena cowboy Joe Scanlon and his horse, Jet, pulled former U.S. Ski Team World Cup competitor Cody Smith of Spokane to win nearly $5,000 and take home the World Championship trophy buckle. While professional skijoring athletes now travel here from more than 1,000 miles away, anyone with the guts, an insurance waiver, an entry fee and a pair of skis can try out this sport. Ping hosts practices beginning Sundays in January and co-organizer Tom Britz hosts a local skijoring league every Saturday for seven weeks. “Big air” becomes the name of the game in the daily Long Jump competition that features $1,000 in added money for the team who can land a straightaway jump for the longest distance — standing upright. Defending Open Champion Tim Guest and his dun-colored rope horse, Cougar, pulled Smith on a crack-the-whip flip off the specially-built jump to distances of 49.8 feet on Saturday and 52.1 feet on Sunday last year. While Ping and his gang of merry-makers gear up to produce the biggest event yet, they emphasize the goal to keep the small-town feel. Ping is doing well in his recovery after his surgeon fused his vertebrate together with two 4-inch screws. • Whitefish World Skijoring Championships Registration Party happens on Friday night, January 27, at the Great Northern Brewery from 5:30-8:30 p.m.
• The competition takes place January 28-29 at the Whitefish Municipal Airport grounds from 12-4 p.m. It’s a huge party. Multiple local establishments offer a wide variety of food and beverage selections throughout the event. • Saturday night the Great Northern Bar hosts a Calcutta where participants bet on the riders. Last year more than $10,000 was raised with some proceeds going to the Whitefish Winter Carnival and other local charities. • Sunday night the Craggy Range hosts the award ceremony and final party. • Spectators are free. There is a nominal $5 per vehicle parking fee and the proceeds go to Human Therapy on Horseback. Visit www.whitefishskijoring.com for more details and lodging packages. Hold your horses! Tight slalom gates can create trouble for skiers being pulled at speeds approaching 50 miles-per-hour. A party atmosphere with food friends and a ceremonial parade is part of the skijoring draw. 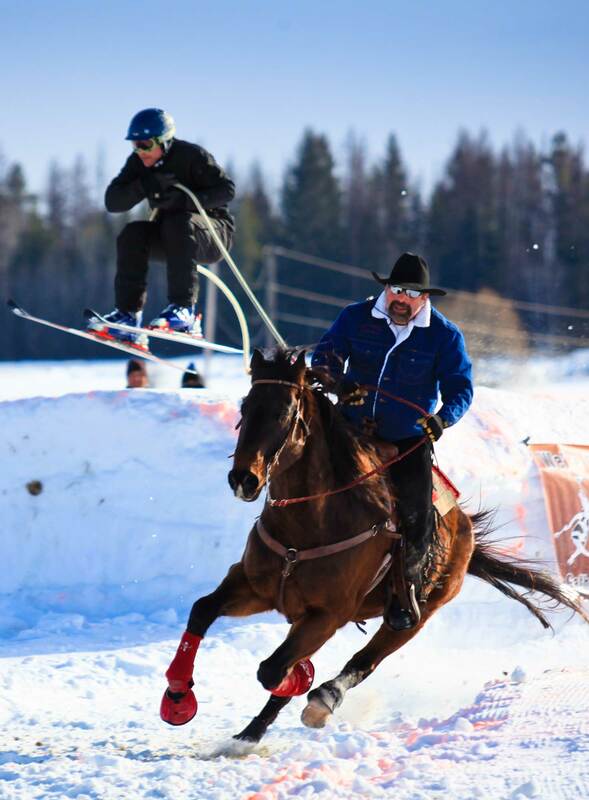 Skijoring organizer Scott Ping and his horse Kona Coffee pull skier Rob Alexander over one of three jumps on the U-shaped, 800-foot long course. 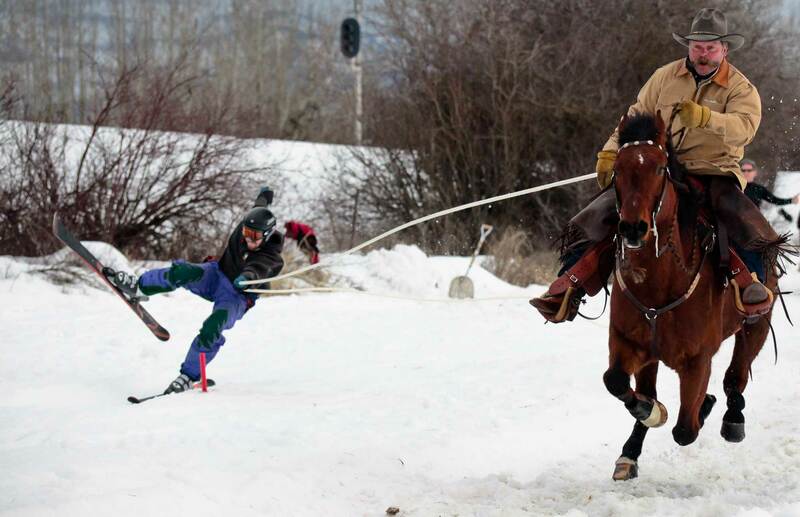 In skijoring, the horse is just as much as athlete as the skier. 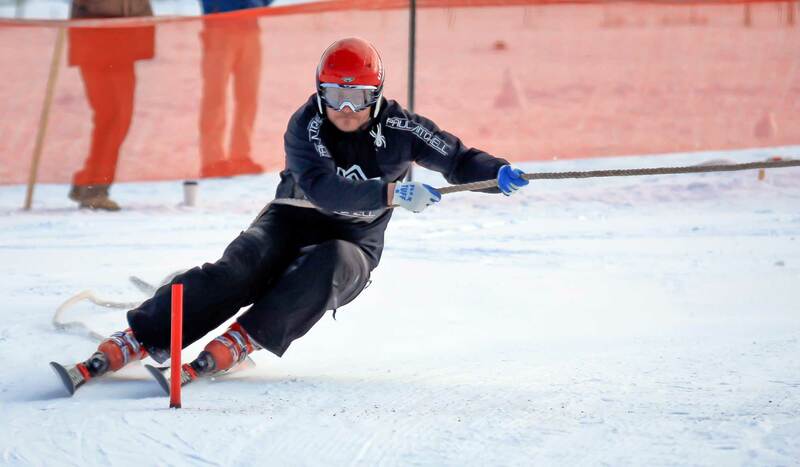 A skier makes a tight turn around a slalom gate.